An educated workforce is essential to meeting the challenges of a thriving bioeconomy. But, what should this education look like? Oregon State University graduate students, Kimi Grzyb and Brian Hartman, set out to answer this question. Working with the Bioenergy Education Initiative (BEI), which is part of the Advanced Hardwood Biofuels Northwest consortium, they assembled a panel of bioenergy experts from across the country, working in industry, academia, and government. Left: Kimi Grzyb, PhD. Right: Brian Hartman, PhD. Using the Delphi Method, they conducted a series of evaluations with the panelists to determine what type of education would best meet the needs of a future bioeconomy. The Delphi Method consists of several rounds of structured communication around a topic or open-ended question with a panel of experts. In this case, panelists were asked to think about the future of a commercial bioenergy industry and economy and what content knowledge they felt students needed to have by the time they graduated from high school or a college-level bioenergy program. After the first round, Hartman and Grzyb coded the expert responses into themes. In the second round, experts were given the list of themes and asked to rank them by their importance. The final round narrowed down the evaluations and resulted in a ranked list of themes. Hartman’s evaluations addressed K-12 education, while Grzyb addressed college-level curriculum. 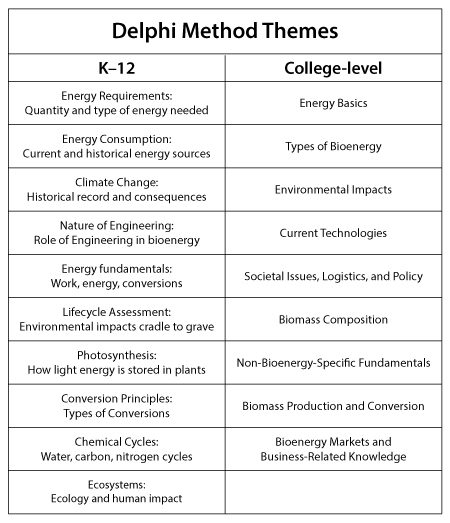 For the K-12 study, the top themes address general scientific and engineering concepts that are not unique to bioenergy. Rather, they would serve as building blocks for a strong energy knowledge foundation. For the college level curriculum, top-ranked themes were more directly related to bioenergy. The results from the Delphi studies are already being used to strengthen the existing Bioenergy Minor program at Oregon State University. Panelists suggested that, rather than a traditional college degree, bioenergy should be a specialized option that can complement a conventional major. They also recommended that students be required to put their content knowledge into practice with a capstone-style project. 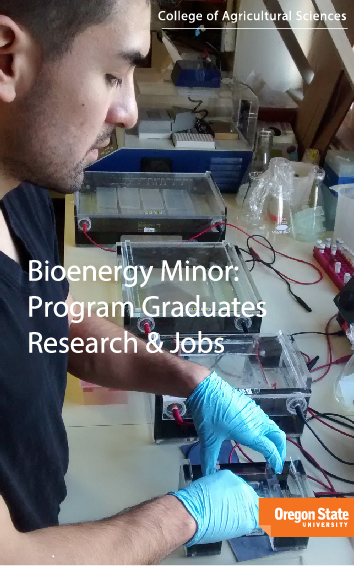 The Bioenergy Minor is open to all majors offered by the university through Spring of 2018 and beyond, depending on funding. The minor also has students engaging in bioenergy-related research with mentors on campus.